VANCOUVER, BRITISH COLUMBIA – August 30, 2017 – Intrinsyc Technologies Corporation (TSX: ITC and OTC: ISYRF) (“Intrinsyc” or the “Company”), a leading provider of solutions for the development and production of embedded and Internet of Things (IoT) products, today announced the availability of the Open-Q™ 626 System on Module (SOM) and Development Kit. Intrinsyc’s Open-Q™ 626 System on Module (SOM) is an ultra-compact (50mm x 25mm) production-ready SOM that is ideal for powering next-generation connected cameras, and other IoT devices. The feature-rich SOM with its advanced processor technology supports premium 4K video with HEVC capture and playback for optimal balance of quality and bandwidth. It offers professional camera features, including: improved dynamic range, enhanced Autofocus performance and computational photography. The SOM offers battery-efficient enhancements to audio, video, and computer vision use cases, PC-class graphics with support for advanced APIs and Hardware Tessellation and enables new always-on use cases at reduced power levels and cost. 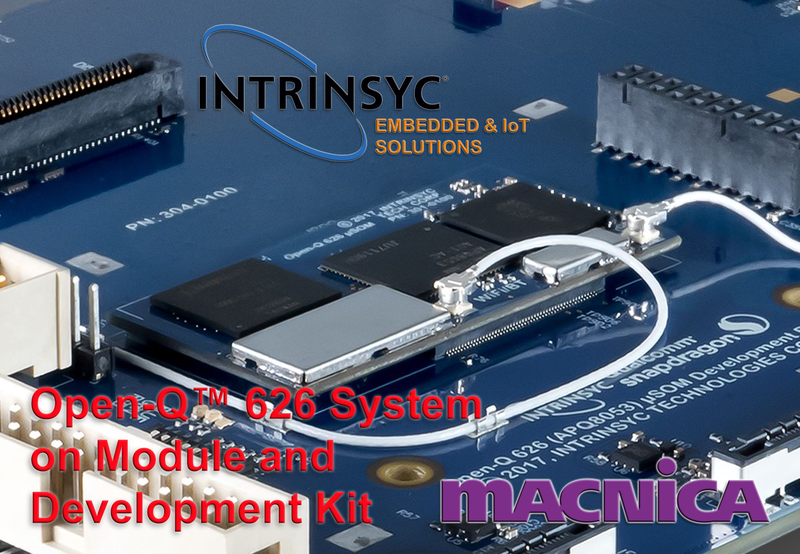 To enable rapid development of devices using the Open-Q™ 626 SOM, Intrinsyc provides a full-featured development platform including the software tools and accessories required to immediately begin development. The development kit marries the production-ready Open‐Q™ 626 SOM with a carrier board providing numerous expansion and connectivity options to support the development and testing of a wide variety of peripherals and applications, ensuring the fastest time to market possible. Intrinsyc Technologies Corporation is a product development company that provides hardware, software, and engineering and production services that enable rapid commercialization of embedded and Internet of Things (IoT) products. Solutions span the development life cycle from concept to production and help device makers and technology suppliers create compelling differentiated products with faster time-to-market. Intrinsyc’s Open-Q™ System on Modules incorporate the industry’s most advanced processor technology and help OEMs to rapidly bring industry leading products, with rich functionality and high performance, to market . Intrinsyc is publicly traded (TSX: ITC and OTC: ISYRF) and is headquartered in Vancouver, BC, Canada. Intrinsyc and Open-Q and their respective logos are trademarks, registered and otherwise, of Intrinsyc Technologies Corporation in Canada, European Union, Taiwan, United States of America and other jurisdictions. © Intrinsyc Technologies Corporation all rights reserved.